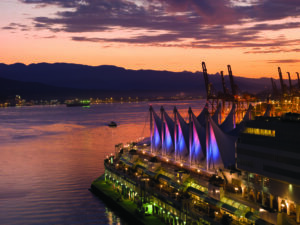 The World Federation of Jewish Child Survivors of the Holocaust and Descendants (WFJCSH&D) will hold our 31st Annual Conference in Vancouver, BC, November 1 – 4, 2019, at the Sheraton Vancouver Wall Centre Hotel. The Kindertransport Association (KTA) will join the conference once again as will members of Generations of the Shoah International (GSI). Vancouver has been described as one of the most beautiful cities in the world, surrounded by rivers and the Pacific Ocean, magnificent mountain ranges and parkland. It has a thriving Jewish community with an active Holocaust education center which reaches over 20,000 high school students annually. Both the community and the Vancouver Holocaust Education Center look forward to welcoming you. The hotel is located in the heart of downtown Vancouver, close to many interesting venues. It is within walking distance to the world-renowned library designed by Moshe Safdie, the Vancouver Art Gallery, Granville Island and Robson Street shopping districts, Gastown and Yaletown as well as Stanley Park and the Seawall. The specially negotiated rates for the conference are available three days ahead of the conference, as well as three days following it. The conference will be hosted by the Vancouver Holocaust Education Center (VHEC) and the local Holocaust Survivor community. Please plan to come early and stay late. There is much to do and see in Vancouver! Check it out at : https://www.tourismvancouver.com/plan-your-trip/ . Watch for updates here at www.holocaustchild.org .